The United States have dominated Olympic basketball since the first tournament in 1936, winning 109 matches and losing only two. That span of success bridges two eras with the event undertaking a massive overhaul in 1992. In April 1989 the decision was made to allow professionals to participate and, as a result, the American squad became a major draw at the Barcelona Olympics. Dubbed the "Dream Team", they featured some of the best-known athletes in world sport, including Larry Bird, 'Magic' Johnson and Michael Jordan - a gold medallist as an amateur in 1984. The USA duly won gold, cruising through the tournament without taking a time-out and winning their matches by an average of 44 points. Coach Chuck Daly described his all-star squad as "majestic". "You will see a team of professionals in the Olympics again, but I don't think you'll see another team quite like this," said Daly, who also coached the New Jersey Nets. Charles Barkley finished as the tournament's leading scorer and Jordan rose to the occasion in the final with 22 points in a 117-85 win over Croatia. Barkley was back in 1996, and fellow originals David Robinson, Scottie Pippen and John Stockton were joined by the likes of Shaquille O'Neal and Reggie Miller. And although the second Dream Team did not reach the heights of the original crop, all other countries were fighting for second in Atlanta, as they were in Sydney 2000. 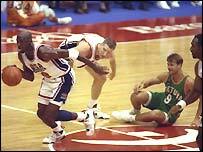 However, four years ago the USA only made the final after squeaking through their semi-final against Lithuania, 85-83. But if that result gives opponents hope, they had better think again with another all-star cast lined up for Athens. And any future gold medal hopefuls also have to contend with the weight of history which is firmly behind the USA. Basketball was invented in America in 1891 and, after being played as a demonstration sport in 1904, the sport made its full Olympic debut in 1936. Despite torrential conditions making play on a Berlin clay court well nigh impossible in a low-scoring final, the USA came through. It was the first of seven gold medals in a run of 63 wins that came to an abrupt end in controversial circumstances against the Soviet Union in 1972. The Americans, who later refused to collect their silver medals such was their dismay, went down by one point, having led by one with a single second remaining. Four years on and that was put in the past as they started another winning run that lasted until their final match before professionalism, a 1988 semi-final loss to eventual winners, the Soviet Union. The women's event, which was introduced in 1976, has not been as one-sided as the men's, but since the American boycott of 1980, the USA have won four of the five Olympics.